GENEVA • When Swiss engineer Carl Eduard Gruner came up with the idea to build the world's longest rail tunnel under the Alps in 1947, he predicted the visionary project could be finished by the start of the 21st century. He would turn out to be off by 16 years. Gruner's sketch and technical paper, called "Journey through the Gotthard Base Tunnel (GBT) in the year 2000", planted the seeds for a venture that will be launched this week and aims to transform travel through the heart of Europe. "It's a big engineering achievement," Mr Martin Knights of the London-based Institution of Civil Engineers said of the venture, which was completed on schedule. 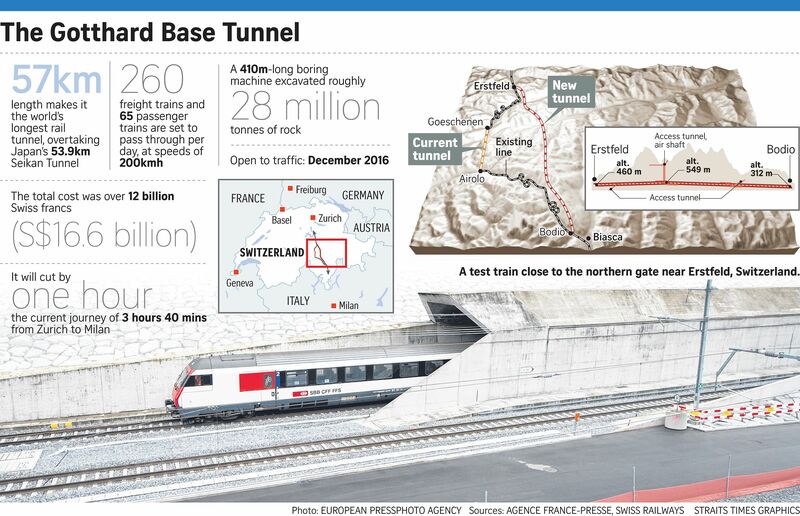 The tunnel runs from Erstfeld in the central Swiss canton of Uri, to Bodio in southern Ticino canton, and will shave the train journey from Zurich to Milan in northern Italy down to 2hr 40min, roughly an hour less than it currently takes. The new route also aims to make rail freight more efficient, including by supporting heavier cargo, which should reduce the number of diesel-guzzling lorries on the roads, and, in turn, would improve traffic and curb pollution. The number of daily rail passengers is also expected to increase from the current rate of 9,000 people to 15,000 by 2020, according to the Swiss federal railway service. In a study of the GBT's possible economic benefits, Swiss bank Credit Suisse forecast a range of positive impacts driven by an easier movement of goods, growth in day-trip tourism and higher property values in the affected cantons linked to increased accessibility. German Chancellor Angela Merkel, French President Francois Hollande and Italian Prime Minister Matteo Renzi, along with Swiss officials, are due to attend Wednesday's grand opening, which will feature a ceremonial run. Full service starts in December. The bumpy road, from Gruner's initial idea to the official start of construction in 1999, included bureaucratic delays and concern over the project's financial viability. Switzerland's federal government set up a committee in 1963 to look into the building of an alpine base tunnel but opinions were split over various proposals, before an official body eventually ruled in 1983 that the project was "not urgent". Momentum in favour of the GBT built again ahead of a 1992 referendum which supported the project, but public outcry about the expense put work on hold. Eventually, a November 1998 referendum closed the deal, when 64 per cent of Swiss voters approved the final plans, along with funding schemes, including a new road tax. Had Gruner attempted to break ground on the tunnel when he conceived the idea 69 years ago, engineers would have had to undertake a costly and dangerous effort to blast and drill through a massive amount of mountain rock. But the project benefited in the end from major technical advances in tunnel-boring machines that began to pick up in the 1960s and 1970s, Mr Knights said. The boring machinery used for the Gotthard Tunnel is "a whole moving factory, half a kilometre in length", which synchronises all the steps needed to carve a passage through a mountain, he added. While cutting through the rock, the machine throws the debris backwards and simultaneously places the pre-formed segments of concrete that form the shape of the tunnel. A separate system grouts the pieces together. More than 28 million tonnes of rock had to be excavated from the mountain near the Gotthard pass. Constructing the 57km rail tunnel took just over 12 billion Swiss francs (S$16.6 billion) and some 2,400 workers, according to Swiss government statistics. A total of 152km of tunnel was carved through the mountain. When it officially opens on Wednesday, the GBT will overtake Japan's 53.9km Seikan tunnel as the world's longest train tunnel and bump the 50.5km Channel Tunnel that links England and France to third place.